DreamHost does not offer a service that automatically moves a domain hosting from one account to another. This means that if you need to move a domain and its files from your account to another account, you need to manually move the domain's contents. This process requires that you download and/or backup all of the domain's files, emails, database, etc., that you wish to move. If you also wish to move a domain registration, you must transfer the registration using the standard domain transfer process. DreamHost is only able to move your discussion and announcement lists. If the domain you wish to move to your account is currently hosted on another DreamHost account, you must create a new account using a dreamhosters.com subdomain. 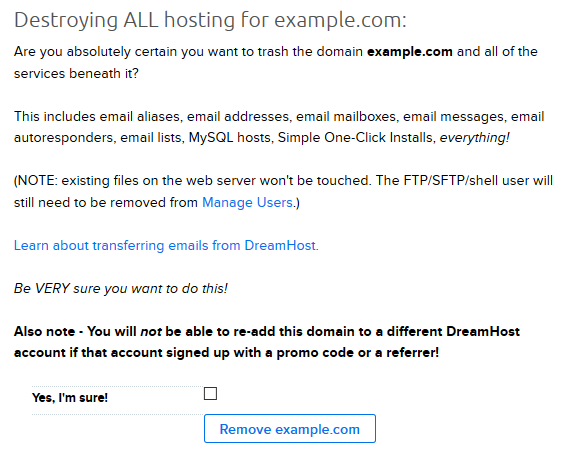 For example, if the site (on the existing DreamHost account) you wish to move to your new account is named example.com, add example.dreamhosters.com as your domain name when originally signing up. Once you've created a new account with this new dreamhosters.com subdomain, you can then proceed with the steps below to move the site to your new account. The Receiving account cannot be using an active promotion, meaning that if the account is still within the first year of hosting and signed up using a promotional discount, it's not possible to add the domain. The Receiving account cannot have a referrer (this also only applies if the account is within the initial year of service). Contact support if you have any questions about the above restrictions. If you wish to move the hosting for a domain to a new account, you must first backup all necessary files. This includes web server files, databases, and email. Do NOT delete the domain from your panel until you have backed up all data. This may permanently delete your data. The following articles provide information on how to make a backup of each. FTP: This article explains how to connect to your DreamHost server using an FTP client. Once connected, you can then download all of your website files to your local computer. These files will then eventually be uploaded to the new account. Backup MySQL: This article explains how to backup your database (assuming you have one). Some simple websites may not use a database. If that’s the case with your website you can skip this step. Transferring Emails: If you have any email addresses hosted with DreamHost for the domain you’re moving, these must be backed up before you remove hosting. This article explains how to use an email client to connect to your address using the POP3 protocol. This allows you to download your email files to your computer. Backup: This is an article detailing how to backup your entire account data. Because discussion and announcement lists require special attention, please contact support on the (Contact Support page before you begin the process. This way, DreamHost support can make arrangements to help you move them. As stated previously, DreamHost cannot help you move any other aspect of your account. How do I move my Discussion or Announcement List? After you have backed up all of your domain’s data, you can now proceed with the migration to the new account. There will be unavoidable downtime as you migrate the domain between accounts. Go to Manage Domains page. To the far right of the domain you’ve backed up, click the Delete button. After clicking the Delete button you’ll be presented with the warning message above. This is to confirm you’ve already backed up your data and that you are sure you wish to proceed with the deletion from this account. Click the blue button to remove this website. You’ll then be presented with a ‘Success!’ message confirming that the domain has been deleted. Log into the second DreamHost account at panel.dreamhost.com. View the Adding a Domain article for details on how to add this domain to be hosted on the new account. Once the domain is fully hosted, you can then proceed to upload all content you backed up in the section above. FTP: Use this article to connect to the domain on the new account and server. You can then upload all website files to the new server. Migrate MySQL: Use this article to import your database to the new account. Email Setup: Use this article to set up your email addresses on the new account. How to import email: This article explains how to import your email to the new account. Once the data has been uploaded to the new account and the DNS has propagated, the site then resolves from the new DreamHost account. Some international domains cannot be transferred from account to account by the customer. In these cases, the receiving customer’s panel requests that they contact DreamHost support for further assistance. It's not required to move the domain registration to the new account to enable hosting for the website. However, having both the hosting and registration on the same account makes it simpler to keep track of both.